The latest update for StratSketch provides a major useful feature that allows it to scale to screen sizes. This means you will no longer have a small map on a large screen, instead you will see it in nearly fullscreen! A new tool, the shape tool has been added, which allows you to create polygonal shapes and regions. Added scaling to make application (nearly) fullscreen on larger monitors. Added the shape tool for creating shaded regions. Move chat to the sidebar to allow for a larger map interface. Many bug fixes and enhancements. This update brings a new coordinate system to allow for scaling across devices. All maps must be converted to this new format, and will be automatically. Certain items such as text and icons may not be in their exact positions or sizes, and may need to be moved. Our first post-release update will address a few new features that have been commonly asked for! Yes, this update is 2.7 instead of 2.6, there are reasons for this because of compatibility between testing versions and an issue with our update system. Added grid numbers/letters on the map and inside sector pings. The map can now be zoomed in with the scrollwheel up to 2x. When zoomed in, maps are now 1024x1024 instead of 512x512, for better quality. If you have any suggestions, check out the StratSketch thread on the World of Tanks forums. Enjoy! The creator of a briefing may now easily clear the items from the map. A demo mode has been added for guest users, allowing for guests to quickly try out map features. Fixed text and tank alignment issues and gave them a better style when moving them. Greatly reduced the amount of out-of-sync items on the map. The /sync command can be used to synchronize the map with the server if an error occurs. Fixed issue with small ping markers and trackers not being removed properly. Added a username to trackers so users can see who is using them. Thanks to everyone who helped test! 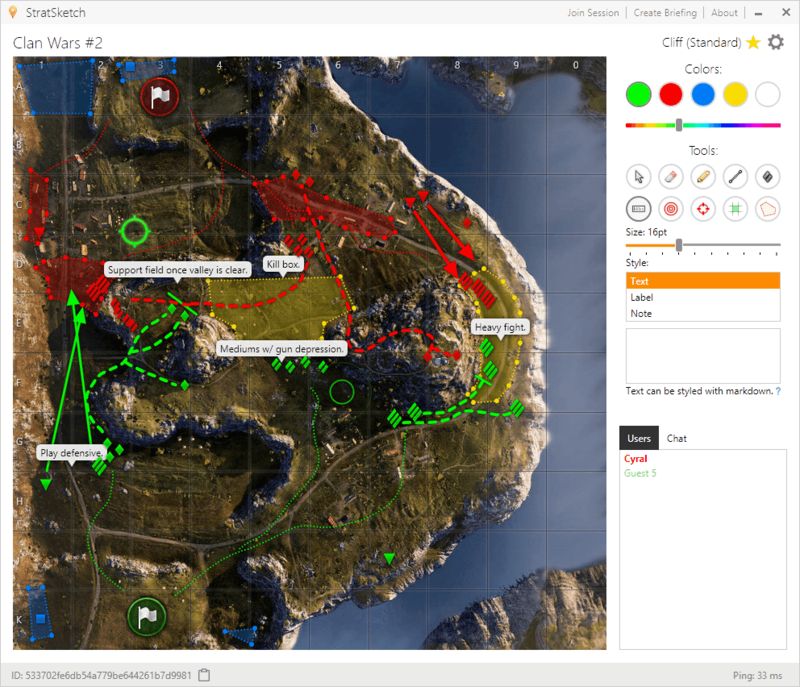 If you know any World of Tanks clans or groups that may be interested in using StratSketch, please let them know! Update: A small patch has been uploaded to fix a minor bug that allowed favoriting of temporary demo briefings and incorrect map spawns after changing the map. We have discovered a few minor issues during our initial testing that will be released in a small update today. StratSketch now displays properly on smaller laptop screens. Lines and paths do not get "stuck" if you drag your cursor out of the window. Line endpoints are easier to grab and move. Text and tank entities are no longer misaligned after rejoining. The spacing around chat messages has been reduced. Text on tank icons has been compacted. The glitch has been fixed that caused users to join the wrong session from their briefing list. If any more issues are found within the next week, another update will be pushed before StratSketch exits beta testing. StratSketch for World of Tanks - Public Beta! Today we will start our public beta test of StratSketch as we test if over the next couple of weeks and gradually start advertising. We have completed StratSketch and fixed the most obvious bugs, but it will require a round of public testing to get everything completely stable. The download of version 0.2.3 has been posted on the StratSketch page. After a week or two of testing, depending on how things go, we will release a stable version of StratSketch (Probably near the 9.7 WoT update) that will be ready to use for your clan! Thanks to everyone who supported development, it's finally here! EDIT: Some users have experienced problems with Antivirus applications interfering with setup, if this is the case, please temporarily disable your AV until StratSketch becomes trusted among major vendors.